When we say “white goods” we are typically referring to household appliances. Here at Anestis Scrap Metal, we recycle white goods, or appliances, on an everyday basis. The next time you’re thinking about throwing your old refrigerator away, bring down to our scrap yard in Somerville MA, and we will pay you cash in exchange for letting us recycle it! We recycle a number of appliances from, stoves, refrigerators, washers/dryers, heaters, AC units, dishwashers and more! We will recycle as much of the appliance as possible, helping to make the environment a better place! 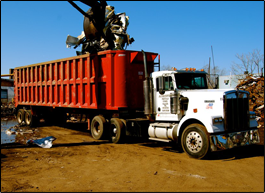 Recycling scrap metal, like old appliance parts, will help make the environment a better place! We even offer pickups for really heavy appliances! For more information about our appliance recycling service, please give Anestis Metals a call at 617-666-3405.